This chapter describes the development of traditional timber-framed masonry techniques as an anti-seismic measure in the course of time and their corresponding seismic effectiveness. Firstly, the evolution of timber framed structures from the Bronze Age to date is presented and the effects on their seismic resistance of the structural changes to which these structures have been subjected since the most ancient construction. It is noted that the appearance of timber in the body of masonry walls in prehistoric Greece after strong seismic events is the first time in the history of mankind that an effort is made to provide a rational method for seismic resistance to buildings. 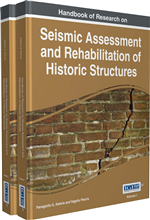 The seismic performance of traditional structures during recent earthquakes is also discussed. A variety of advanced analytical modelling strategies for these buildings is presented, from a detailed micro-model to macro-model procedures. The potential seismic vulnerability of these buildings is investigated using statistical data from recent earthquakes. Empirical fragility curves in terms of PGA, PGV and macroseismic intensity from the 2003 Lefkas earthquake damage data are presented. The first experimental research on TFM was conducted in Portugal (Santos, 1997) and involved three specimens extracted from an existing building from the Baixa region in the Lisbon historic centre. The walls were subjected to horizontal reversed cyclic loading at the top beam without vertical load and developed considerable ductility and energy dissipation capacity. An important observation is that the initial elastic phase of the response, which ends with un-nailing of the diagonals from the surrounding frame, was very short. Failure of timber-framed walls was due to distortion of the geometry of the frame and partial out-of-plane failure of the masonry infills. A recent experimental research also in Portugal (Meireles et al., 2012) involved three large-scale specimens constructed in the laboratory that were shorter than the aforementioned ones taken from the old building. Joints were constructed as similar as possible to those found in old buildings. A cyclic loading protocol appropriate for timber structures was used (Krawinkler, 2001). Failure appeared when masonry infills fell off and the diagonals buckled out-of-plane. The specimens presented high displacement and energy dissipation capacity. They also displayed the pinching effect due to un-nailing of the diagonals and sliding of the masonry infills. Early detachment of masonry infills was observed and their influence on the overall response of the timber-framed walls was low. Damage Statistical Data: Data collected after a seismic event regarding damage to structures. This data should be related to some measure of seismic intensity at the location of the structures. Lefkas Earthquake: A strong (magnitude M w = 6.2) earthquake that occurred off the North West coast of the island of Lefkas (Greece) on August 14, 2003, which caused ground failures and damage to structures. Timber-Framed Masonry: A traditional type of construction generally consisting of masonry walls that include timber elements. There are many styles of historic framing across the world but those originally developed as an earthquake resisting element commonly form a perimeter frame with diagonal braces and masonry infills. Macro-Model: A model developed at the macro-scale, i.e. each structural component (e.g. a wall or a brace) is modelled as one element. Earthquake-Resistance (Anti-Seismic) Measures: Design and construction measures aiming to provide resistance of structures to earthquakes. In the context of modern seismic design, this means that for minor earthquakes there should be no damage, for moderate earthquakes structural and non-structural damage is expected but it should be repairable, and for major earthquakes there may be major, unrepairable, structural and non-structural damage but collapse of the building should be avoided. Micro-Model: A model developed at the micro-scale, i.e. each structural component (e.g. a wall or a brace) is discretised into a substantial number of elements. Empirical Fragility Curves: Fragility is in general the susceptibility of a structure to suffer loss due to catastrophic events. Mathematically, a fragility curve provides the probability that a structure (or a type of structures) suffers a certain degree of damage for a given earthquake intensity . Such curves derived from damage statistical data are called empirical curves.